The football tradition of tailgating has a long history, especially in the United States. The two go hand in hand and some enjoy the pregame festivities of a good tailgate more than the game itself. As someone who has tailgated for almost 13 years, and has fought for the right to do so, I am encouraged that the club has decided to explore this idea. There are obstacles to overcome of course, and in the e-mail, the club acknowledges that “There are still many steps that need to be taken in order to bring some of these great ideas to life…”. One of those steps would be to work with the various levels of government, and the people who own the parking lots surrounding BC Place Stadium, which has always been brought up in my discussions with the Lions about tailgating and the lack of it in the past. The quote above also speaks of “bring your own picnic style food”. It’s unclear whether that would include barbeques being permitted, which has also been an issue we have fought for in the past. And really, without a BBQ, a lot of the fun of tailgating is taken away. The smells of the food wafting throughout the lot, the competition between tailgaters to cook elaborate meals are all part of it. Currently, our group tailgates at the parking lot at Quebec and Terminal, across the street from Science World, thanks to the fine folks at Easy Park, and some help from the city of Vancouver, I was able to get permission to use the lot. As a community, we police ourselves and after we have left, you would never know a tailgate party happened. We leave the lot free of garbage and have never had an incident that would put this privilege in jeopardy. The perception of some is that tailgating is about drinking, but it isn’t. It’s about cooking yourself and your friends a nice pregame meal and having a few beverages. 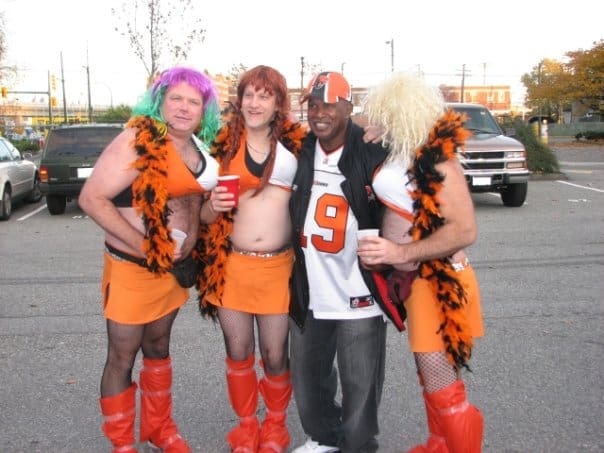 But most of all it’s about the social aspect and spending time with friends and fellow fans to get geared up for the game. We’ve hosted fans from other teams and Lions players have popped by on their way to and from games. One thing that is missing from our tailgate is that we aren’t near the stadium. It takes away a little of the atmosphere, and we have about a 15-minute walk to and from the stadium. The Lions proposed model seems to be following one implemented in Toronto last year, their first at BMO Field. From all accounts, it was a success there and while you can argue it didn’t help their attendance, those that took part enjoyed the experience. Barbeques are permitted, and while you can’t bring your own alcohol, an ice-cold beer is reasonably priced at $4.00. 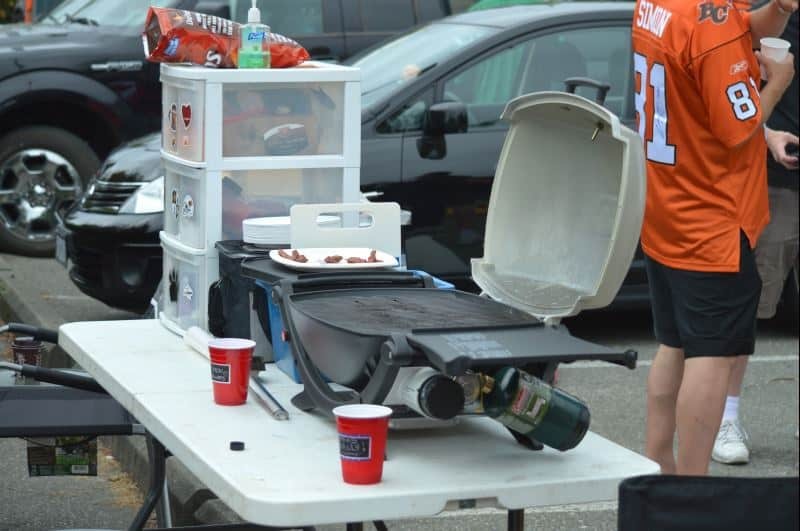 In Calgary, the tailgating capital of Canada, season ticket holders are sold tailgate passes and there is a waiting list to get one. I would imagine this would be a part of the Lions plan as well, and it’s a good way to do it. It’s another perk of being a season ticket holder and if you abuse the privilege you lose your pass. Some, even in my group, won’t like this and may even choose to just stay where they are without the imposed rules of any sanctioned tailgate. However, the Lions need to start thinking out of the box to get fans back inside the stadium. This is a good start, and one I would likely support depending on the cost. Making going to a game an event is a key, especially to the younger demographic that the Lions have seen stay away from attending games. Hopefully, the Lions can work out the issues and make this happen. If you build it, they will come. I’ve seen it happen myself.